Im Abonnement enthalten ist ein kostenloser Online-Zugang zum aktuellen und zu allen seit 2016 erschienenen Jahrgängen. Zusätzlich können Abonnenten die kostenlose App 'Quintessence Journals' nutzen. The Forum Implantologicum offers scientifically based educational papers, in particular illustrated narrative review articles. 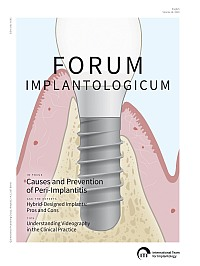 The Forum Implantologicum aims to provide its readership with pertinent scientific information on topics of current relevance translated into the context of daily clinical practice. It also provides a regular overview of ITI activities, developments and events. The global burden of ageing also presents a challenge for dentistry. our patients are becoming older and losing their natural teeth later in life. It is widely acknowledged that advanced age alone is not a contraindication for implants; it is the chronic conditions of the older patient, the treatments and side effects, as well as concomitant functional impairment that may limit the survival and success rates of dental implants. For many chronic conditions, the evidence in relation to implant survival is lacking or inconsistent, for example in osteoporosis and diabetes. other conditions show similar implant survival rates to younger adults. In patients having undergone radiotherapy, implant survival rates appear lower. The only absolute contraindication for implant placement is anti-resorptive therapy in the treatment of bone metastases. In addition to risks related to chronic conditions, functional impairment, oral hygiene, immunosenescence, and patient compliance should be considered. For example, complex sophisticated reconstructions should be simplified in good time and overdenture retention adjusted to aid autonomous denture management. The decision whether or not to provide dental implant treatment to the ageing patient, even with multiple morbidities and a complex pharmcotherapeutic regime, cannot be based on the predicted outcome in terms of implant survival or success alone. It requires due consideration of the patient's life expectancy and the potential increase in quality of life, weighed against the morbidity of the procedure itself as well as potential adverse effects on the activities of daily life. The mean age of candidates for implant surgery as well as dental patients is generally increasing due to the growing life expectancy worldwide. While being older per se is no contraindication for implant therapy, it often implies medical conditions and more medication (polypharmacy). These aspects often reduce the resilience of patients and lead to increased risk of complications after implant surgery. The present review first describes typical dental and medical conditions of the elderly and their relevance to implant surgery. The main focus is subsequently set on surgical strategies in elderly patients to minimize the related morbidity without compromising the treatment outcome. Whenever possible, a standard implant placement without simultaneous bone grafting is preferred to offer a low-morbidity procedure. The use of short implants as well as narrow diameter implants is important to avoid bone grafting procedures. In addition, the frequency of flapless implant placement using computer-assisted implant surgery (CAIS) has increased considerably over the past 5 years and has become a highly attractive surgical approach in terms of minimal invasiveness. With the so-called "baby boomer" generation reaching retirement, a new challenge in implant dentistry has emerged. Predominantly, tooth loss occurs later in life, accompanied by increased demand for partial dental prostheses. edentulous patients are more difficult to treat due to advanced age, functional dependence, illness, and financial instability. Prosthetic planning becomes more complex as interindividual diversity increases with age. Considerations such as resilience, physical and mental status, medical history, and drug prescriptions must be individually assessed. Treatment planning and restoration design should fulfill both functional requirements and esthetic demands. Prosthesis design should prevent further harm to the patient. This tertiary prevention approach should prevent local inflammation of the oral tissues, but also prevent secondary systemic infections, such as aspiration pneumonia. There are many prosthetic options for partially or fully edentulous patients. Dental technicians should be aware of the advantages and disadvantages of the various treatment concepts and materials, and contribute professional knowledge to the patient, dentist, and often thirdparty milling centers. Using CAD/CAM technology, customized attachments and prostheses can be individualized according to each patient's requirements. Utilizing a combination of manual and digital production techniques, oral reconstructions can be rationally manufactured. The duration of implant osseointegration remains unknown, but reports of up to 30 years' follow-up are emerging. hence, the environment of the implant - the patient - will change significantly, and implant restorations should be flexibly designed to meet the changing needs of an aging patient. This "back-off strategy" should be implemented, and prostheses should be continuously subjected to critical reevaluations and adaptation. Tooth loss undoubtedly has a social and psychological effect on patients. Replacement of missing teeth using implants can provide a more stable outcome that greatly improves a patient's confidence when smiling, speaking and eating. however, implant-supported restorations need regular review. Whilst survival and success rates are no lower in the elderly, there are some particular issues. These include increasing medical comorbidity, polypharmacy, reduced salivation, difficulty in attending appointments and declining oral hygiene. In addition, patients may not be suitable for surgical management. Therefore, easier-tomaintain- and-manage implant solutions should be considered in elderly patients in case of complications. ITI Funded Research - Meet the Researchers! Forum Implantologicum talks to Prof. Dr. Rosemary Shinkai about her ITI-funded study "Risk factors on the prognosis of single short implants in the posterior region - a prospective clinical study"
Tapered vs. Cylindrical Implants: What is your Clinical Preference? In this issue the question we are looking at is Tapered vs. Cylindrical Implants: What is your Clinical Preference? We have asked Stephen Chen, David Cochran, France Lambert and Ali Tahmaseb to summarize in less than 250 words the principles they follow when taking this decision. Apple's Keynote Software on its 15th Birthday: Our Baby is All Grown Up! Lozano jr., Frank E. / Martin, William C.
ITI Scholars: The Experience of a Lifetime!